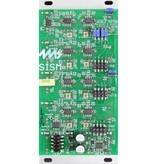 The SISM is a 4-channel voltage manipulator that can scale, invert, attenuate, shift (dc offset), mix, split, and slice your CV and audio signals. A plethora of red and blue LEDs (14) show exactly what each channel and output jack is doing: red = negative voltage, blue = positive. 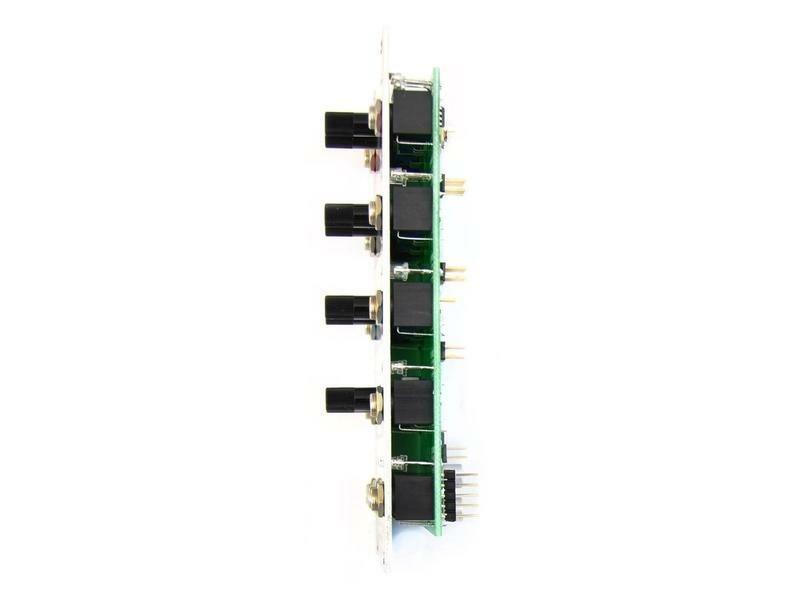 Each channel is independent and has an input jack, output jack, a knob for attenuating/inverting (Scale), and a knob for applying positive or negative DC offset (Shift). Four jacks on the bottom combine the four channels in different ways. 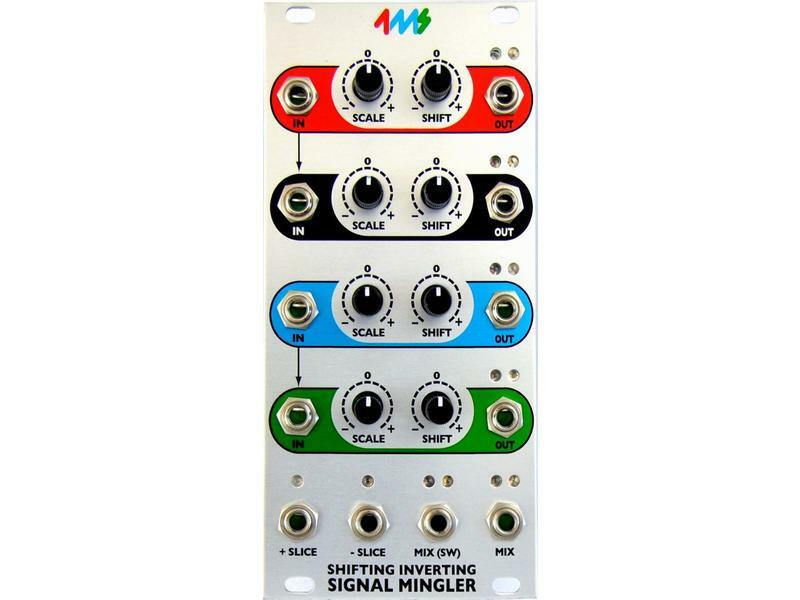 Mix is a straight mix of all four shifted inputs, Switched Mix is a mix of all channels that have nothing plugged into the OUT jack, Positive Slice is the sum of all output voltages greater than zero volts, and Negative Slice is the sum of all negative voltages. By Shifting some channels positive and some negative, the + Slice and - Slice jacks can be used as sub-mix outputs. 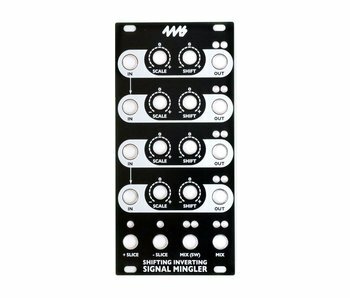 Also, by running a slow triangle wave into one channel, the remaining channels can be made to "dirty pan" between the Slice jacks: the signals are half-wave rectified as they span between both outputs. Channels 1+2 and 3+4 are normalized together on the input jacks, which is handy for splitting a signal into two or more altered forms. Jumpers on the back allow you to disable this normalization. 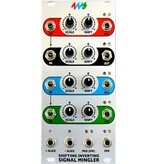 Each channel also has a jumper to make the Scale knob unipolar (no inverting, attenuate only). This is useful for mixing audio instead of CV. 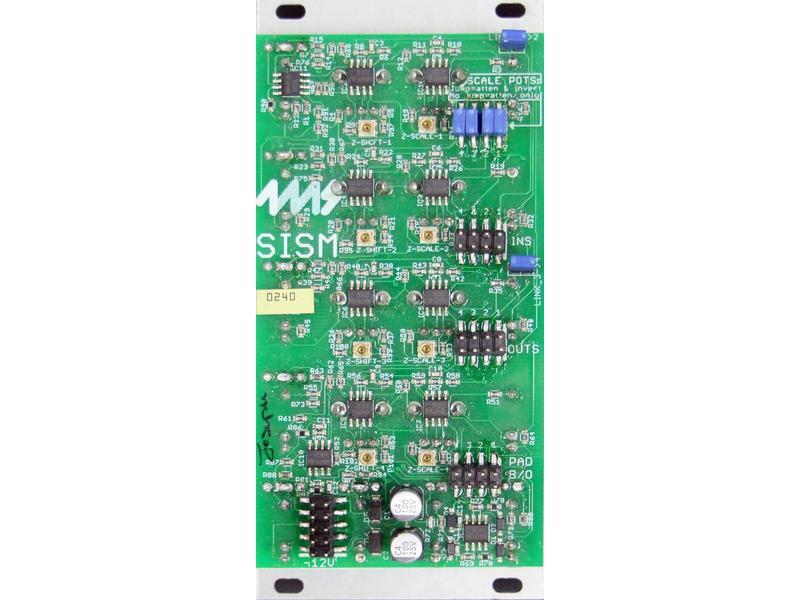 A breakout header allows for padding of the signal (useful for fine-tuning a precise voltage such as 1V/oct). Input and Output headers for connecting to QCD, QPLFO, VCA Matrix, or other manufacturer's modules such as Toppobrillo Mixiplexer or Circuit Abbey Intermix.